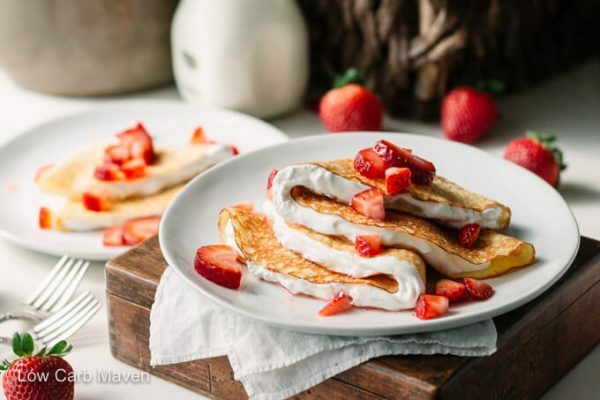 Keto strawberry crepes are soft coconut flour crepes filled with luscious whipped cream are topped sweet fresh strawberries. The perfect low carb anytime dessert! I’ve received a lot of positive feedback on my coconut flour crepe recipe. It’s an easy almost no-fail recipe. Many low carb crepes are too delicate and break when flipping or are stiff and don’t fold like a traditional crepe. This recipe is very much like a traditional crepe, although a little thicker. 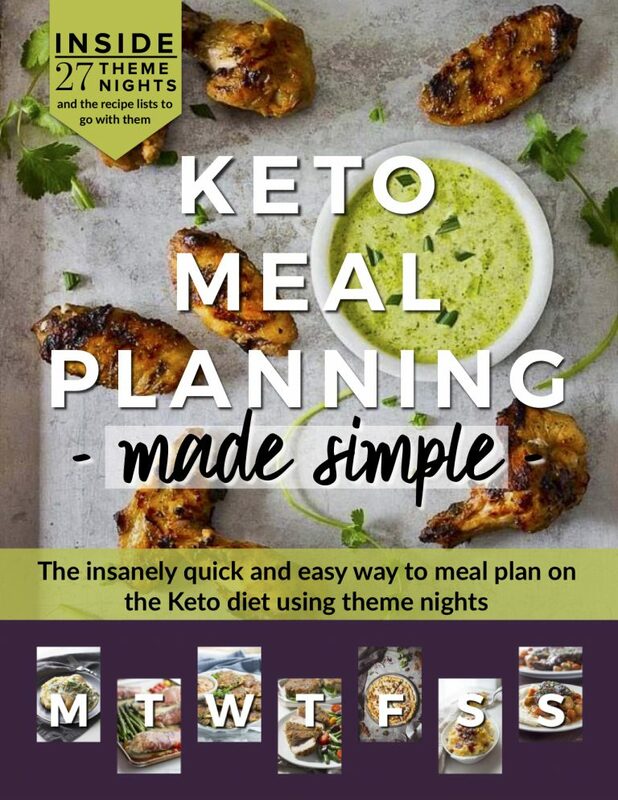 An internet search on low carb or keto crepes will turn up many recipes. My guess is that most of the recipes will get you what you want by degree. Some have less ingredients but may taste eggy. Others may be so delicate that they are hard to flip and tear. 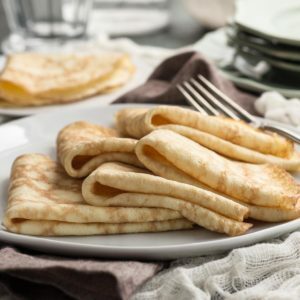 Still others result in stiff-textured crepes that crack apart upon folding or rolling. My coconut crepe recipe has more ingredients than most and a surprise ingredient! I spent many hours testing many iterations of the recipe until the taste, texture, and ease factor were to my satisfactory. It’s a great recipe perfect for both savory and sweet recipes. 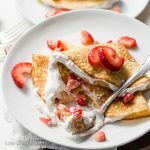 My favorite at the moment is enjoying these keto strawberry crepes and whipped cream! What I love about keto dessert crepes is that the crepes can be made several days ahead. They can be filled with almost anything at a moments notice: whipped cream, sugar-free strawberry jam, sugar-free nutella, ricotta cheese, sour cream, plain yogurt. All it takes is a little imagination. Crepes with strawberries and whipped cream is a classic combination and one which I like best. To make the recipe I sweetened and whipped heavy cream and folded it into sour cream. Then, I sliced fresh strawberries and added a splash of sweetened Brandy and let them macerate. It took just a second to fill the crepes and add a few strawberries on top. Keto Strawberry Crepes are 4.5 net carbs per serving. 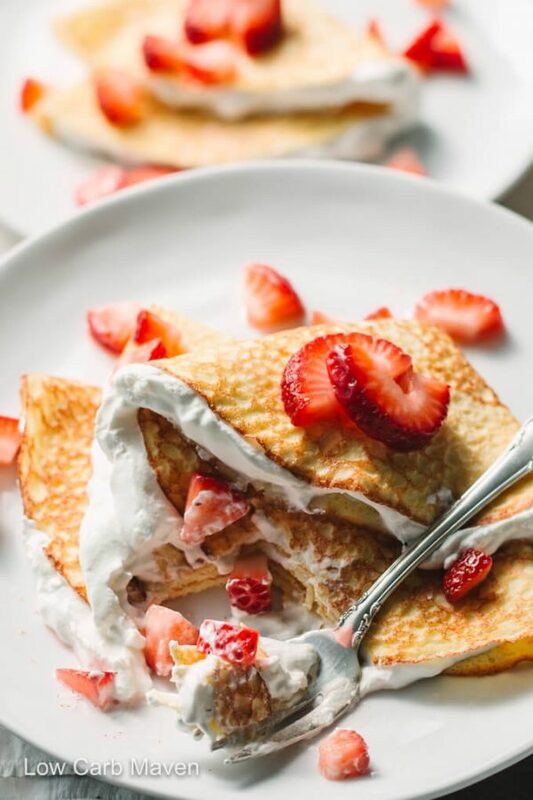 Soft coconut flour crepes filled with luscious whipped cream are topped sweet fresh strawberries. 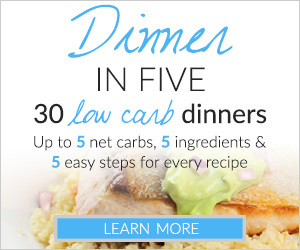 The perfect low carb anytime dessert! Add the Brandy (or water) and water to a small bowl with 1 tablespoon of the sweetener and mix to dissolve. It may not dissolve completely. Slice the strawberries and place into a smallish bowl. Add the Brandy mixture and stir. Set the bowl aside while the strawberries macerate. Measure the heavy creme, the remaining sweetener, and vanilla into a 2-3 cup capacity bowl. Whip until very stiff. Stir the strawberries and spoon 1/4 of the strawberries and juice over each filled crepe. Serve. Serves 4 with one filled crepe each. The time on the recipe assumes that you have already cooked the crepes. Oh, my gosh! These crepes are AMAZING. I actually thin the batter with a little water, between 1/4 and 1/2 cups of water to get a thinner crepe. As a result, I also get more crepes, between 12-16 total (if I don’t break too many on the flip). I leave out the sweetener and have been using them for savory recipes like enchiladas and cannelloni. Thank you so much! My family thanks you too! Kim, your crepes have parmesan or asiago cheese in them. Do you adjust that at all for the sweet crepes or does the flavor still work ok? 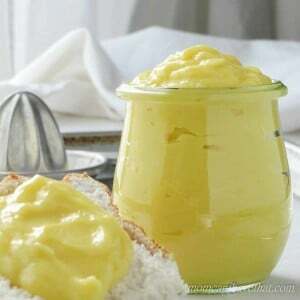 Might protien powder work as an alternative for the sweet ones instead of the cheese? 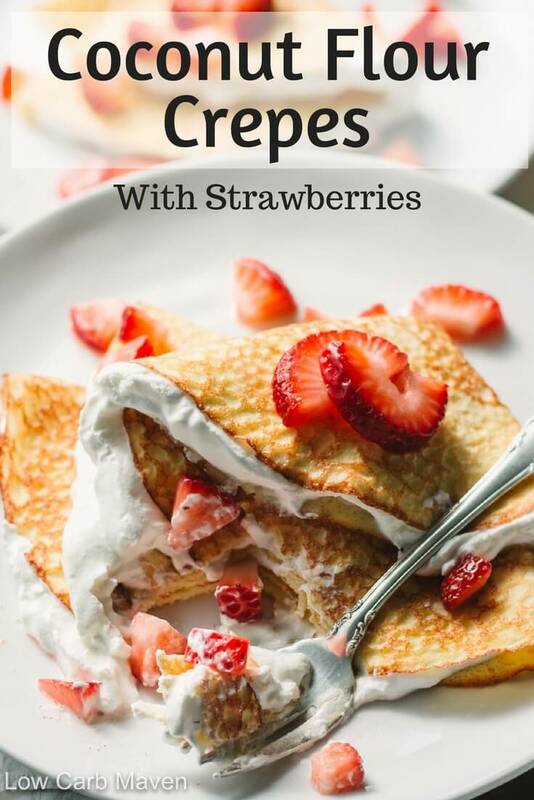 These look terrific and want to try them….perfect season for crepes with strawberries. Hi Lonna. I’m not exactly sure of what video you are referring. Do you mean the video on Instagram I talk about in the crepe post? You have to scroll down quite a ways in the Instagram feed and look for the photos of the pan. There are two, side-by side. I made them on my phone before videos were a thing. In one I pour the batter in the pan and swirl the pan to spread the batter and in the other I show how I flip them. 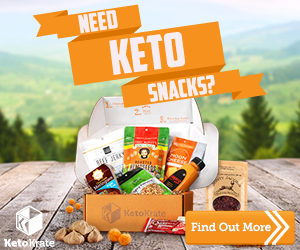 Could you please tell me how many servings are in your nutritional chart? 4 or 8? I love crepes! 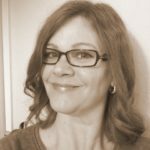 Thank you for creating a recipe using coconut flour! I can’t wait to try it! I seriously love crepes with strawberries and whipped cream. Look at this photo! Thank you, I can’t wait to try.